Integrin linked kinase (ILK) is a molecule that had long stumped researchers. While it was widely accepted that ILK plays an important role in cell adhesion, which is important for an array of physiological processes ranging from blood clotting to host immune defense, and that it is overexpressed in many diseases including cancer, diabetes and heart failure, the field was unclear on what ILK was. Some thought it was a kinase; some thought otherwise. For more than a decade, there was no definitive answer. Then, in 2009, a team led by Jun Qin, PhD, Department of Molecular Cardiology, showed for the first time that ILK was not a kinase but instead a pseudokinase. As implied by the name, pseudokinases are a specific type of protein that look like kinases but do not have the catalytic properties characteristic of kinases. The Qin laboratory purified ILK and uncovered the molecule’s detailed crystal structure for the first time. In doing so, they found that ILK lacks the kinase region responsible for catalysis, called the active site, explaining why it is a pseudokinase. The Qin lab has taken this investigation further, providing new understanding in a paper recently published in Nature Communications about how ILK functions as a pseudokinase. Dr. Qin and his team found that ILK utilizes its unique pseudokinase shape to bind two other proteins called PINCH and Parvin to form a complex called IPP. They showed that this ILK-centered IPP complex assembles and holds actin filaments in specific bundles. These actin bundles importantly control the morphology of the cytoskeleton, or the backbone of the cell, which is critical for cell adhesion and many cell adhesion-dependent processes including cell growth and migration. Interestingly, the researchers also found that IPP-mediated cytoskeleton change is regulated by Mg-ATP bound to ILK’s pseudoactive site. Mg-ATP is typically required for kinase catalysis, but in this case, ILK evolved to bind Mg-ATP for unique non-catalytic function. Without Mg-ATP binding, ILK—which is believed to fuel cancer cells and other disease processes—does not function effectively. This new finding opened the door for Dr. Qin and his team to develop a compound that mimics Mg-ATP binding and inactivates ILK. They have shown that it significantly suppresses tumor growth in a preclinical model of triple-negative breast cancer, suggesting it is a good candidate for clinical study. More research will be critical, but Dr. Qin is hopeful that this compound may also be used in other diseases where ILK is overexpressed and dysfunctional. The work—which has been considered an important advance by F1000Prime, a platform for evaluating important biomedical papers by the world’s leading scientists and clinicians—was performed by Julia Vaynberg, PhD, Koichi Fukuda, PhD, and Fan Lu from the Qin lab, in collaboration with the lab of Edward Plow, PhD, and Yinghua Chen, PhD, of Case Western Reserve University. The National Heart, Lung, and Blood Institute and the former National Center for Research Resources, both part of the National Institutes of Health, supported this research. 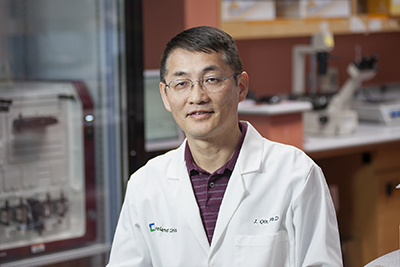 Dr. Qin holds the Bonnie and Eunice Collins Endowed Chair for Innovative Diabetes Research.